Our products are distributed worldwide under either private labels or our own label and are renowned for their reliability and innovative technology. Whether bought under distributors' names or the Niles Electronics label. Learn how our industry-leading solutions help our customers achieve the lowest Total Cost of Ownership. Electron-Beam Gun Switching Power Supplies with industry-leading reliability. Capable of powering from one to three guns with up to 15kW. Manuals for our products are available in PDF format and are fully up to date. Please click on the button below to access all our manuals. Developer of the world’s first Electron Beam Gun Switching Power Supply and the market leader since 1990. Our products are distributed worldwide and renowned for their reliability and innovative technology. When performance and reliability is essential, Niles Electronics is the only right answer. NE Series Power Supplies are designed for the 208V, 3Ø and 60Hz American voltage source while NEU series for 400V, 3Ø and 50Hz European voltage source. Other than the difference of the power source, all the other features are exactly the same. Both NE and NEU series power supplies are used for single gun. The output power ranges from 4KW to 10KW. 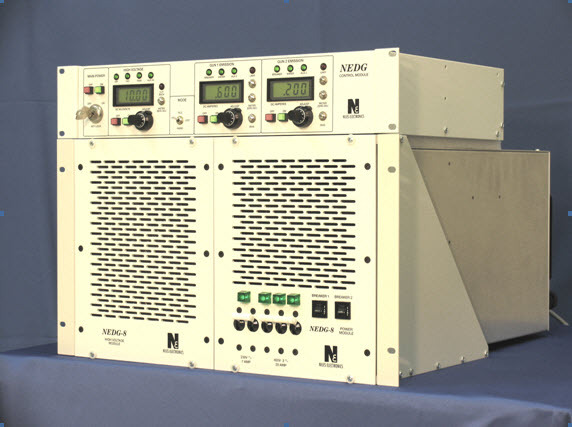 NEDG Series Power Supplies are designed for 2-gun application. DG stands for dual gun. They can work with either American or European power line source voltage. The output power ranges from 6KW to 10KW. You can distribute its power to both guns at any ratio between 0% and 100%. It means that you can funnel its 100% power to one gun if you want to. Hydra is a 15KW, 3-gun power supply. It only takes 400V, 3Ø power line voltage. If it is used in the US, a step-up autotransformer is required. Like NEDG series power supplies, you can distribute its power to all 3 guns or just one of them with 100% power. The e-Beam Sweep is a traditional analogue sweep. Its unique spiral sweep is a peerless feature. It heat up the surface of the pocket evenly with a spiral sweep pattern. There are 3 different remote controls to choose from. The Preciem Programmable Sweep is a digital sweep. It has up to 100 steps in a sweep pattern and can store up to 120 patterns on the machine. It can stand alone or interface with PC by using PSLink software. You can also create or modify the patterns on your PC then download to the sweep. There are 96 spots on the e-beam gun pocket. By programming, you can make the beam where to go, stays for how long. Thus, you can make the beam where to go and where not to go.